Last month’s trailer for Chilling Adventures of Sabrina made it chillingly clear that Netflix’s take on the decades-old Archie Comics character would be one we haven’t seen before. Today, the streaming service doubled down on that promise by releasing a new clip featuring the title character’s first meeting with her scene-stealing familiar, Salem. You can check out the clip via YouTube below and let us know what you think in the comment section. In the original comics, Salem Saberhagen was a former witch who attempted to take over the world. As punishment for his actions, he was forced by the Witch’s Council to spend 100 years as a cat. He eventually came to live with Sabrina and her aunts, Hilda and Zelda Spellman, and he took on a role as Sabrina’s mentor. Salem was voiced by Nick Bakay in the Sabrina the Teenage Witch sitcom starring Melissa Joan Hart, and he was a frequent source of laughter for the studio audience. The Netflix show’s interpretation of Salem is a little harder to pin down. In the new clip, we see Salem transfigure himself from a shapeless, tentacled shadow in Sabrina’s closet to the feline form we’re all used to. He goes on to explain that he’s answering Sabrina’s summons in the woods. Considering that the show is planning on dabbling in occult related themes, we have to wonder if the character’s motivations are as altruistic as they were in previous incarnations. 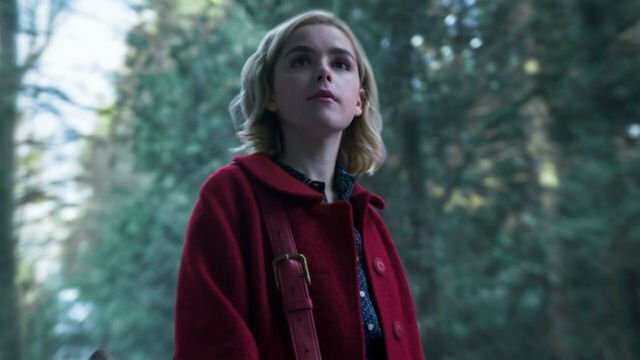 Kiernan Shipka is playing Sabrina in this new series, which was developed by Roberto Aguirre-Sacasa and based on his ongoing comic series of the same name. Other cast members include Lucy Davis as Hilda, Miranda Otto as Zelda, Chance Perdomo as Sabrina’s cousin Ambrose Spellman, Jaz Sinclair as her best friend Rosalind Walker, and Michelle Gomez as Mary Wardell. Every episode of the show’s first season will be available on October 26.